Greetings, Loyal Reader. I received several offline comments about my last post, Interview with a Mexican. I want to thank you for your kind words. I am unsure if any subsequent postings will be on par with that one, but alas, the show must go on. Last weekend, I wanted to stretch my legs and take advantage of unseasonably warm temps. I sought to revisit the canals and “floating gardens” of Xochimilco, first visited on my inaugural trip to Mexico City in November, 2002. 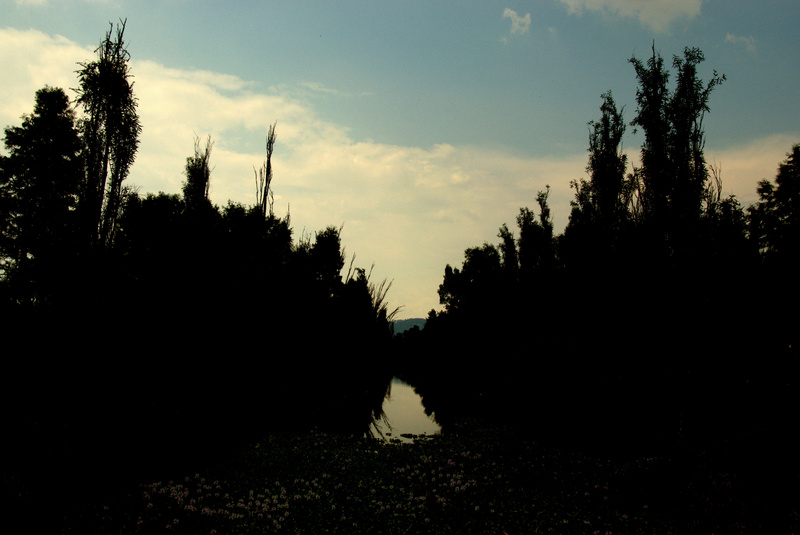 The canals of Xochimilco – the silty remnants of the lake upon which Mexico City was built – sprawl for dozens of kilometers through the city’s southwest. As such, there are several options for exploring. 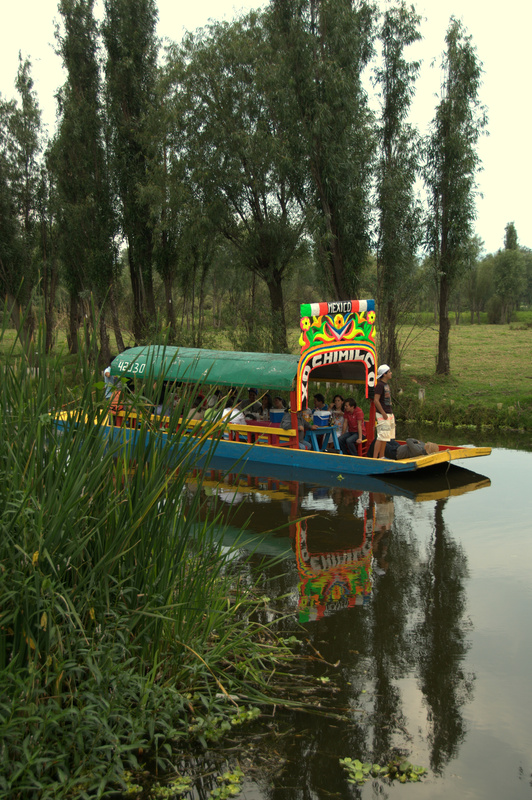 Most popular are hour-long trajinera (gondola) rides departing from the village-like neighborhood of Xochimilco, last stop on Mexico City’s tren ligero (light rail). Gondolas typically feature a woman’s name painted in bright colors, and they are punted (rowed) through tranquil backwaters. Once reaching a main waterway, things liven up as your boat encounters dozens of other gondolas. On weekends especially, a party atmosphere takes over. Whole families rent out gondolas for the afternoon, and mariachis punt from boat to boat, offering their musical services (for a tip, of course). If you’ve visited Bangkok’s floating market, you’ll find this experience reminiscent of that one…with gondolas replacing motorized longboats and with beer and trinket vendors replacing fruit and vegetable sellers. As much fun as the above trip can be, I hankered for something a bit more serene. 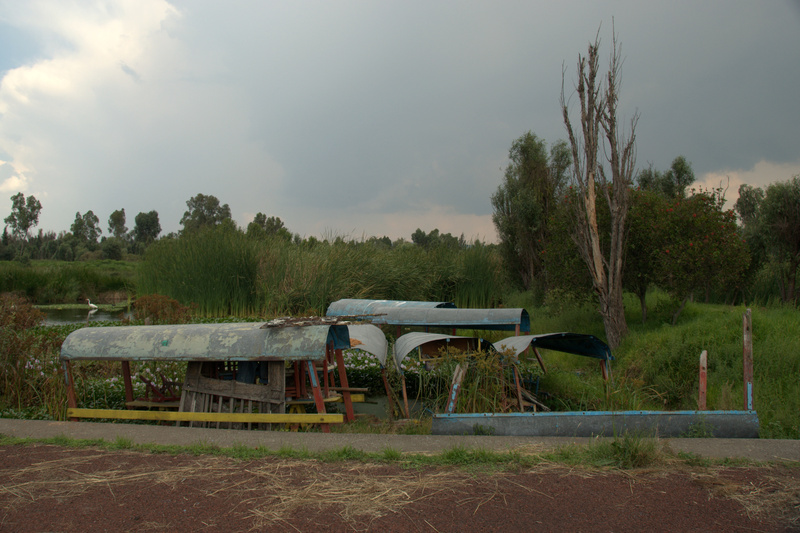 I first read about Parque Ecológico de Xochimilco several months ago, and the place about which I read seemed to fit the bill. Getting there seemed easy – a short metro ride and an easy bus connection. Then again, I didn’t know what the entrance looked like – and Sunday is Market Day, so local traffic through two neighborhood markets slowed my journey to a crawl. The “20 minute” bus ride ultimately clocked in at almost 50. 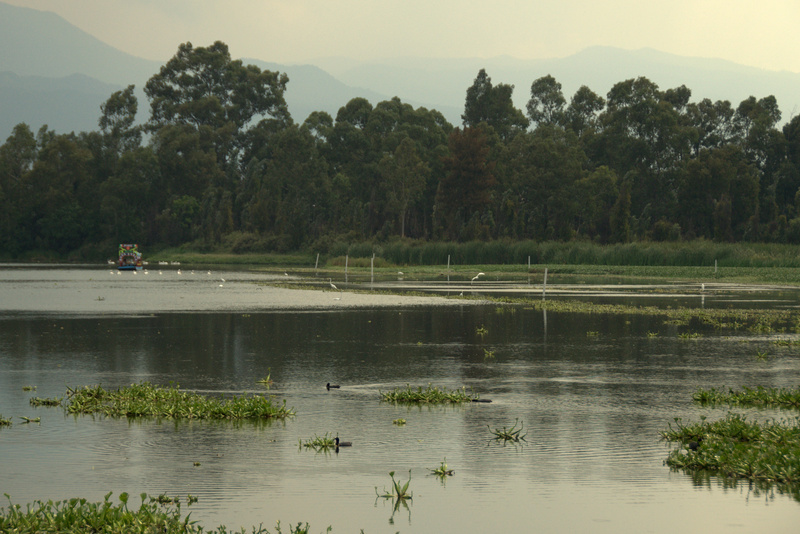 Parque Ecológico de Xochimilco is a large expanse of flat land – chinampas (floating gardens), corn fields, small lakes, the occasional canal, and several hours worth of walking and cycling paths. 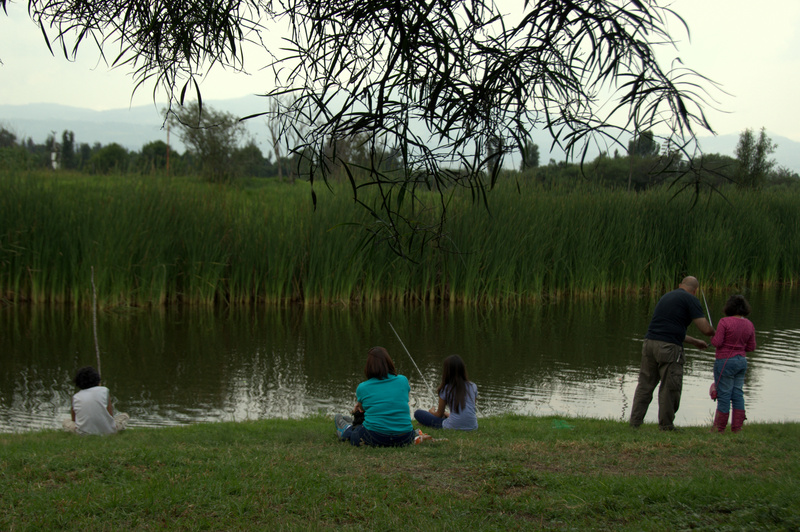 The lago (lake) near the entrance seems to occupy most visitors, who rent fishing poles or paddle boats for an afternoon’s entertainment. I spent a few minutes here taking pics, then set off down the trail to see what else was on offer. After no more than ten minutes the families disappeared and I had the place to myself, the occasional bicyclist notwithstanding. There was nothing but open fields in all directions; how could I still be in a city of roughly 20 million people?! “This place is for the birds,” my dad would cheekily say in reference to the rich avian life in the park. I am no expert, but I think most were ducks and egrets. The ducks seemed friendly enough (I suspect people feed them), but the egrets were rather skittish. 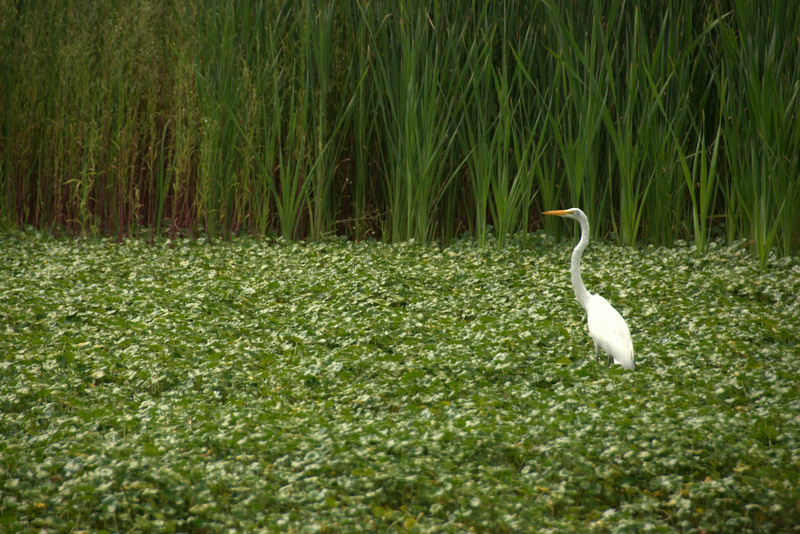 Every now again the walking path would pass alongside a canal or lake, and I would almost certainly spot an egret perched on a lily pad or in the edge of the cattails, no doubt waiting for a fish to near the surface. Most attempts at photography were disastrous – either the birds would flee or their white bodies would “bleed” onto the green floral background. Any attempts at Manual shooting were futile, as I needed a tripod for balance. Try setting up a tripod on water’s edge with a skittish wetlands bird just 50 feet away; think he’ll stay put? That said, it truly is something to see these magnificent birds take flight. 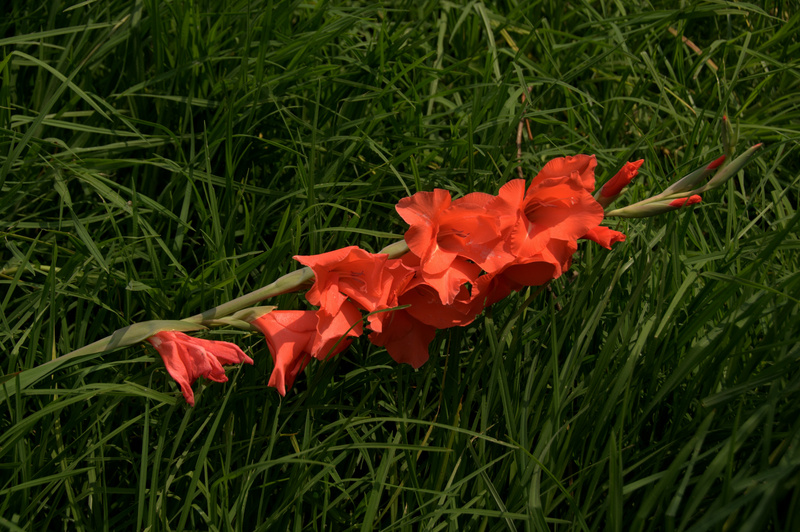 I walked farther than anyone had bicycled and was about to turn back (I had heard distant thunder, though overhead skies were still mostly clear), when I saw something colorful from the corner of my eye. It was glimpsed for just a moment near the forward horizon line, where the flat open fields met a wall of trees. I continued forward out of curiosity. Almost without warning, the path came to a “T,” with a small canal immediately in front of me. 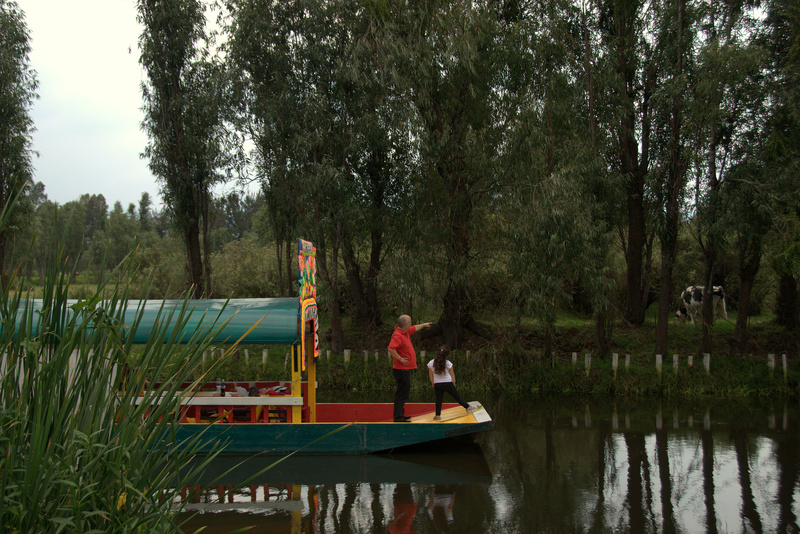 “Something colorful” turned out to be a trajinera, punted by a lean Mexican male and its only passengers being a father and his young daughter, pointing excitedly at something on the other side of the canal. I looked in their direction and, between the tall trees on the opposite shore, saw a quartet of grazing cows! 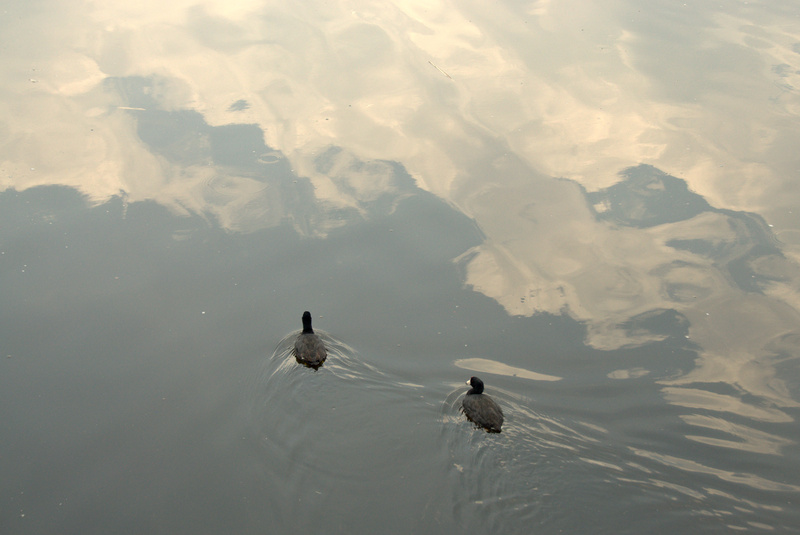 As Elsie and Friends grazed contentedly, this trajinera floated past…and then another…and another…and another. 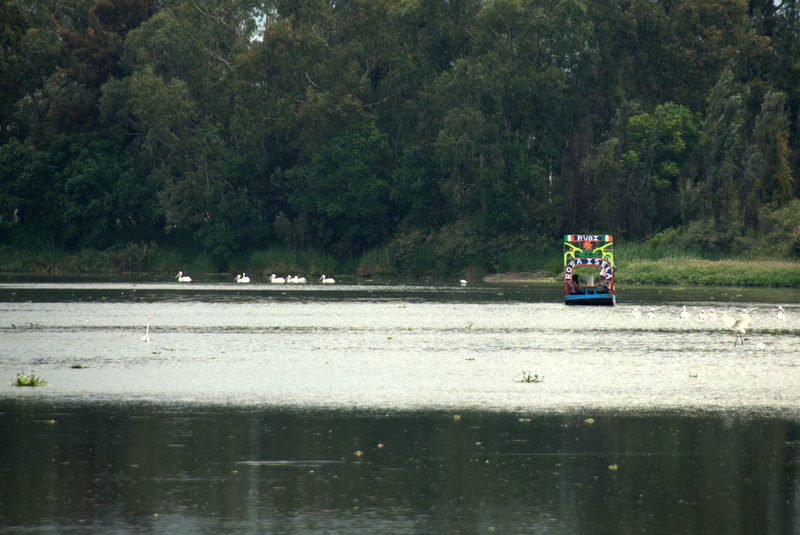 I am unsure where these gondolas embarked from, as Xochimilco village was a long way from here. My only guess is Embarcadero Cuemanco, farther north than the other launch points. As it happens, Embarcadero Cuemanco is the launching point for all-day punts to La Isla de las Muñecas, literally, Island of the Dolls. I haven’t visited there yet, as a gondola ride is best enjoyed with a group of friends and my friends aren’t sufficiently curious enough to join me. From what I’ve read, though, the island is home to hundreds of discarded dolls, warped by the elements and hanging from the island’s trees, very Necronomicon-like. According to legend, they were tended to by local eccentric Don Julian Santana in memory of the supposed drowning death of a local girl – that is, until his own mysterious drowning in 2001. You can read more about it here; anyone up for a spooky adventure? I took a different route to the exit, and eventually came upon a much larger lake with hundreds of birds and a few more trajineras. 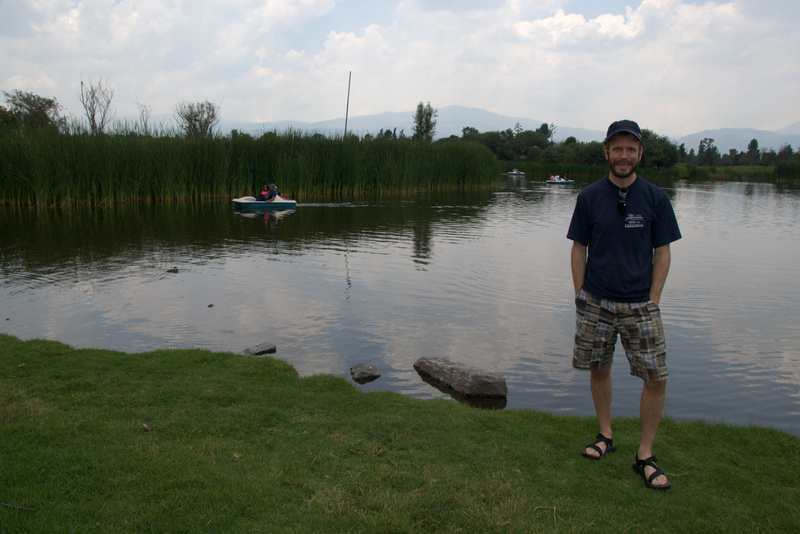 I finally found the park’s own gondola depot; methinks a ride here is not a booze cruise but instead focuses on bird watching, as this waterway appears to be cut off by Anillo Periférico, the “Ring Road” that circumnavigates Mexico City. More thunder clapped somewhere overhead and yet the late afternoon sky was as clear of clouds as it had been at any point that afternoon. I shall come back here soon, I promised myself, and I’ll drag my friends kicking and screaming if I have to. Well, hopefully just kicking, as any screaming will likely scare off those skittish egrets and possibly get me tazed in the huevos.